Coral Interactive is part of the Gala Coral Group UK that primarily focuses on offering its clients sports betting services with coral.co.uk being the company’s main brand. Coral Interactive is the division charged with handling telephone, mobile and online casino operations for the Coral Brand. As one of the leading United Kingdom casino brand, with years of experience in offering online services, Coral UK casino prides itself as the most trusted website especially for offering its customers a wide array of gaming and betting opportunities and products. With Coral mobile application, you can now access the services offered at the site while on the go. Coral.co.uk in conjunction with Coral’s 1,700+ strong retail estate ensures that all of Coral’s customer have access to consistent product experience in all the available channels. This includes the fast-paced “In-play” betting market where Coral UK is known to offer unique services. Coral Online Casino’s latest offering is the mobile betting app which allows you to place your bets and play the various casino games while on the go. The Coral UK mobile promises you the best possible online casino service through whichever channel you may decide to choose. 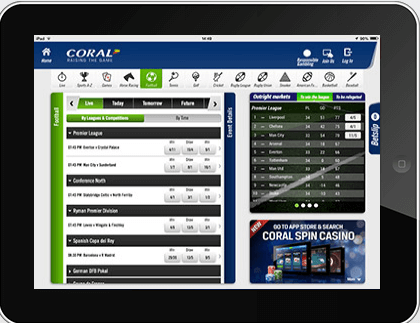 As you will later see on in the review, the Coral UK mobile application has numerous betting features that are featured in other competing bookies as well as unique features which you will only find in the application. Why Should You Use the Coral UK Mobile Application? With the Coral UK mobile application, you can easily place bets, updating you on the latest prices whether you are at the races, at the pub or on your way home from supporting your favorite EPL team. With the application, you can easily place bets on football matches, racing events, tennis tournaments, as well as other sports events that you may come across at coral.co.uk. Additionally, the mobile application is easy to use. All the important features have been placed in the right places making it very easy for you to locate it. Also, you can learn how to explore the various features without too much hustle. How Do You Access the Coral UK Services? There are different ways through which you can access the Coral UK mobile services. First, you can easily download the mobile application to your phone by clicking on the download application found at the bookmakers’ homepage. Alternatively, you can directly access the bookmaker through the flash option where you use supported browsers to play the games at the website or place your bets online. From a user’s perspective, it’s highly recommended that you download the mobile application straight to your device. With the mobile application, you can easily keep track of the events by turning on the notifications. Moreover, the Coral UK mobile application has been customized so that it gives you the best experience on any device or PC you are using. What Does the Coral UK Mobile App Have to Offer You? You can easily place your bets as the match proceeds thanks to the in-play market. Additionally, you can turn the notifications on so that you can keep track of every match that you wish to know how it is proceeding. 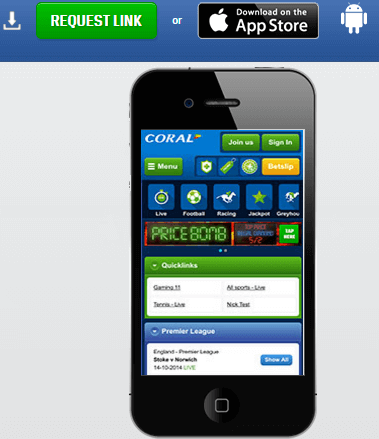 With the Coral UK mobile application, you can receive notification of some of the best-priced odds. Additionally, you will automatically be notified when there is a price boost in odds. This way, you will have access to competitive odds. With the Coral UK mobile application, you can now easily access your transactions history as well as your gaming history at the site direct from your mobile phone. You do not have to wait to reach home to make the deposit as the games start. Simply, click on the deposit funds option, select your preferred method and tap deposit to load your account. If you prefer placing bets on the number of goals, anytime goal scorer, or handicapping, Coral UK mobile application should be your number one choice. Browse Corals comprehensive range of markets using the Coral UK mobile application today. With the Coral mobile application, you can easily log and manage your account without having to use the desktop application necessarily. Once you are logged in, you can opt to remain logged in for future purposes and consequently place in-play bets easily. Other notable features of the Coral UK mobile application include an easy to use spontaneous interface; an eye-catching theme as well as the live streaming feature where you can watch different sporting events as they take place. Where Can You Download the Coral Mobile App? As already mentioned, the coral mobile app is not available on Google Play store due to the restrictions that Google Play store has imposed on real money gambling applications. Therefore, you can only download it from the Coral Casino website and follow the instructions on how to install at the site. How Safe is the Mobile Application? The Coral Mobile Casino application is as safe as the website itself. It is protected by the SSL Certificates which is the standard internet security technology used to protect banking institutions online. The SSL Certificates refer to small data files, which digitally binds a cryptographic key to the casino's details. With this SSL certificates installed on the casino’s websites, it will activate a padlock and the famous https protocol, which creates a secure connection between the casino's website and your account. This way, all your personal information that you transmit to and from the casino through the Coral App is safe and secure from third parties.